"Small Towns, Black Lives: African American Communities in Southern New"
Small Towns, Black Lives: African American Communities in Southern New Jersey - A Photographic Journal by Wendel A. White, September 2 - October 21, 2005, Opening Reception: September 15, 6-9 p.m with gallery lecture by Wendel A. 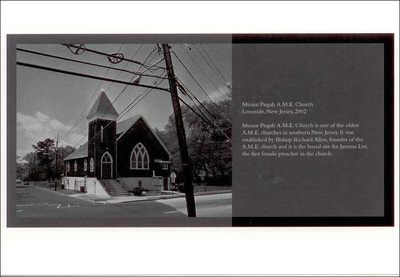 White at 7 p.m.
Curated by Charles Ashley Stainback, Small Towns, Black Lives consists of more than 70 black and white photographs depicting historically African American towns in New Jersey, such as Morris Beach, Port Republic and Small Gloucester. More than fifty of these images are on exhibit at Seton Hall. The exhibit includes essays by author Stedman Graham, historian Clement Alexander Price and Deborah Willis-Kennedy, author and expert on African American photographic history.